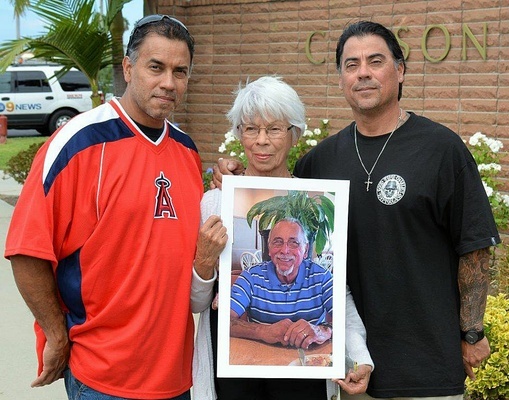 Frank Hernandez, an 85-year-old Latino, died Wednesday, June 7, after being assaulted in the 300 block of East 220th Street in Carson, according to Los Angeles County coroner’s records. Hernandez was walking in his neighborhood around 10 a.m. May 31, heading for a nearby liquor store to purchase lottery tickets, Los Angeles County Sheriff’s Lt. Derrick Alfred said. When he was about two blocks from his home, a man ran up behind Hernandez and struck him the head, Alfred said. When Hernandez fell, the man took his wallet. The attacker then ran to a nearby home, where a man was standing outside the garage. The thief demanded money from that man before striking him in the face, Alfred said. He ran away when the man’s wife came outside. Paramedics took Hernandez to a nearby hospital. He died a week later, at 4:27 p.m., according to coroner’s records. Hernandez had lived in the Carson neighborhood for 60 years, Alfred said, and had four children and nine grandchildren. He and his wife had been married for 60 years. The Carson City Council has approved a $25,000 reward for information leading to the arrest and conviction of Hernandez’s assailant, described as a Latino in his 20s with a light complexion and curly hair that was shorter in the front than in the back, Alfred said. The suspect was wearing a gray hooded sweatshirt, dark shorts and a dark baseball cap at the time of the attack. In a strained but composed voice, Lucy Hernandez pleaded for information about her husband’s killer. Where are these posters of this killer posted. I have yet not seen one nor has anyone else...why not on street corner Store? Why not everywhere? We want him off of our streets. — Donna Joslin Oct. 4, 2017 at 11:23 a.m.
— SikNtired Sept. 20, 2017 at 8:34 a.m.